I pulled in from my trip last night around 7:30 pm. I had been on the road since 5:30 am and boy was I happy to be home. After leaving my dad's house in the wee hours of the morning, I picked up my Miss M and her friend. They were at a youth camp called EFY, it's put on at BYU and is just for youth between the ages of 14-18. It was an AMAZING experience for her. I'll share more about that later. However, one of the highlights of yesterday's trip was bringing this little guy home to my husband. In fact, I was so excited about him, he sat in the front seat with me and was the first thing out of the car, the luggage could wait. I couldn't wait to give him to my husband. 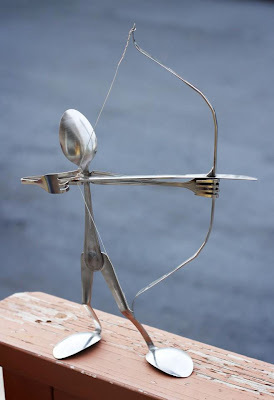 We love quirky things and he loves archery so it was a perfect combination! Before we left the Salt Lake Valley, we made a quick stop at a Farmer's Market in down town Salt Lake. I've been wanting to hit that place for two years but the stars never aligned. It's one of the best Farmer's Market's I've been too. It's a great mix between produce, arts and crafts, and fun musicians. Awesome stuff, indeed. Just as we were about to leave we passed this both called Forked Up Art. It's all sculpture art made from silverware. I'm not in love with the company name as it's plays on a swear word and you know me and my prudish way... oh anyway, I do love their products though. It's quirky and fun. My husband and daughter are way into Archery so when I saw the above little man, I couldn't pass it up. The cool thing is the price was right on! As most hand crafted art is usually over-priced, I actually had to question the boy in the booth about the price. "Are you sure it's ONLY $20?" Sold! And, to top it off, I found out the business is run by a kid who just graduated college, has a young family and hires other college kids to help him make these awesome figurines. All of their items are made here, in the US. I like to support the locals! So, today I give my compliments to the creative crafter: Forked Up Art! Plus, one more cool thing about them. They will do special orders. So, if you have someone with a hobby, like scuba diving, they could probably make you a scuba man! Anyway, go check them out.... Christmas is coming, just sayin'! *** - This was NOT a sponsored post. These opinions are all mine because I was excited about something I found and just wanted to share the love!